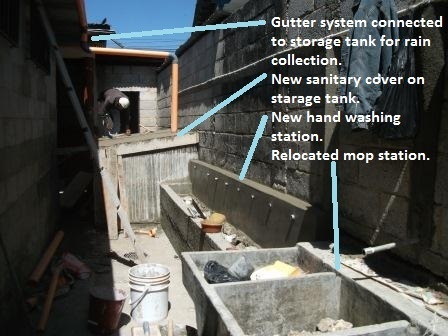 The school had decided after receiving funds that they did not have room for a storage tank and wanted to repair an existing tank at the rear of the school. The tank was inspected and found to be sound. Repairs were made to the tank to make it more sanitary for water storage. Instead of building a tank style hand washing station a 9 faucet wall style hand washing station was built.